We often think of growth as happening one direction. Growing things expand and get older, they don’t shrink or get younger. If something is not moving forward, then it’s not growing. But maybe that’s not always the case, especially when we’re talking about personal growth journeys. Growth like this doesn’t happen all at once or in a steady direction. Sometimes, a thing that you thought you dealt with will come back and needs to be worked through again. You often have to keep going back over the same ground in order to make progress. This isn’t failure to grow. But it might look like it depending on our perspective. If we’re the type of person who wants to get everything right the first time, then it can be discouraging when we find ourselves having to deal with something we thought we’d already worked through. We might even decided that since we failed once there’s no point in trying again. But that isn’t really a healthy or helpful perspective. Sometimes reminders to grow come as a gentle nudge. Other times they smack you upside the head. It’s sort of the same way that God sometimes speaks to you in a still small voice and other times He uses a trumpet blast. Because of Saul’s disobedience and pride, God rejected him and moved on to the next step in His plan. He gave the prophet Samuel time to grieve Saul, since there is “a time to mourn” (Ecc. 3:4), but now God expected him to move on. Similarly, in our lives, there is a season to mourn when something bad happens. However, we’re not meant to stay there. I was already thinking about my breakup that happened 4 months ago when the rabbi started talking about this subject, and then he specifically used a relationship ending as an example. So when he said, “There are a few people here who really need to hear this message” I felt like I was definitely one of them. As we approach the Passover season, it’s traditionally a time of reflection and self-examination. It’s good to have moments like that where we consider what God has to say about our lives, the areas where we need to repent, and different ways we can continue to grow and change. At my Messianic congregation, they’ve shared that certain rabbis teach that if you are still in the same place you were a year ago you have backslid. We can’t maintain a sort of “status quo” in our walk of faith. Either we’re moving toward God or we’re moving away. There’s no place for complacency in a Christian life. God expects growth. That doesn’t mean we need to be constantly on-edge and second guessing if we’re “good enough,” though. He doesn’t expect us to already be perfect, but He does expect us to keep going that direction. 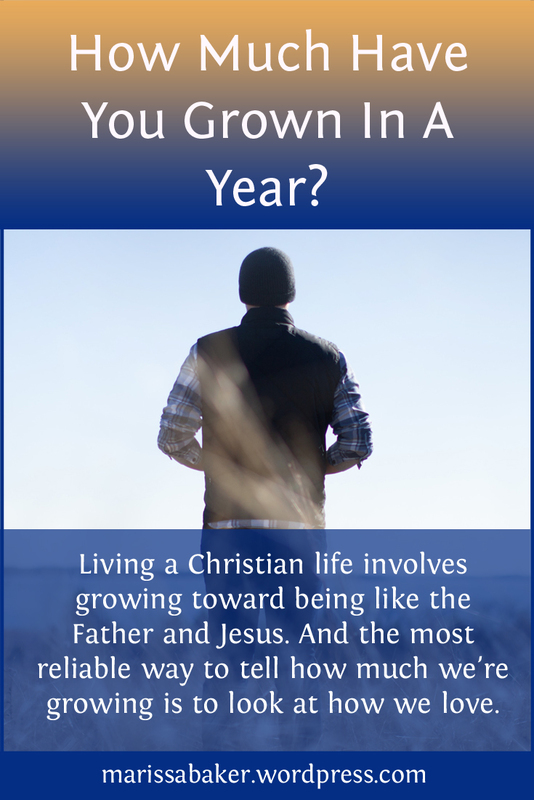 Such growth involves becoming more like God in every aspect of our lives. The more we grow, the more His character, desires, priorities, etc. are reflected in our own lives. What are the most important things to focus on as we try to grow as Christians and learn more about God? You’ll hear various answers. Some say preach the gospel, citing the great commission as our primary goal. Others devote themselves to good works. Some study prophecy. I like to point to the passage where Jesus identified the greatest commandments. We can all tell how important these commands are from the way Jesus describes them. But I think we too often see them just as a starting place when they should be a continuing focus. We should never stop learning how to love God and our neighbors.